Error results from physiological and psychological limitations of humans.2 Causes of error include fatigue, workload, and fear as well as cognitive overload, poor interpersonal communications, imperfect information processing, and flawed decision making.3 In both aviation and medicine, teamwork is required, and team error can be defined as action or inaction leading to deviation from team or organisational intentions. Aviation increasingly uses error management strategies to improve safety. Error management is based on understanding the nature and extent of error, changing the conditions that induce error, determining behaviours that prevent or mitigate error, and training personnel in their use.4 Though recognising that operating theatres are not cockpits, I describe approaches that may help improve patient safety. Multiple sources of data are essential in assessing aviation safety. Confidential surveys of pilots and other crew members provide insights into perceptions of organisational commitment to safety, appropriate teamwork and leadership, and error.3 Examples of survey results can clarify their importance. Attitudes about the appropriateness of juniors speaking up when problems are observed and leaders soliciting and accepting inputs help define the safety climate. Attitudes about the flying job and personal capabilities define pilots' professional culture. Overwhelmingly, pilots like their work and are proud of their profession. However, their professional culture shows a negative component in denying personal vulnerability. Most of the 30 000 pilots surveyed report that their decision making is as good in emergencies as under normal conditions, that they can leave behind personal problems, and that they perform effectively when fatigued.2 Such inaccurate self perceptions can lead to overconfidence in difficult situations. A second data source consists of non-punitive incident reporting systems. These provide insights about conditions that induce errors and the errors that result. The United States, Britain, and other countries have national aviation incident reporting systems that remove identifying information about organisations and respondents and allow data to be shared. In the United States, aviation safety action programmes permit pilots to report incidents to their own companies without fear of reprisal, allowing immediate corrective action.5 Because incident reports are voluntary, however, they don't provide data on base rates of risk and error. The results of the line operations safety audit confirm that threat and error are ubiquitous in the aviation environment, with an average of two threats and two errors observed per flight.7 The box shows the major sources of threat observed and the five categories of error empirically identified; fig 1 shows the relative frequency of each category. This error classification is useful because different interventions are required to mitigate different types of error. By latent threats we mean existing conditions that may interact with ongoing activities to precipitate error. For example, analysis of a Canadian crash caused by a take-off with wing icing uncovered 10 latent factors, including aircraft design, inadequate oversight by the government, and organisational characteristics including management disregard for de-icing and inadequate maintenance and training.3 Until this post-accident analysis, these risks and threats were mostly hidden. Since accidents occur so infrequently, an examination of threat and error under routine conditions can yield rich data for improving safety margins. Discussion of applications to medical error will centre on the operating theatre, in which I have some experience as an observer and in which our project has collected observational data. This is a milieu more complex than the cockpit, with differing specialties interacting to treat a patient whose condition and response may have unknown characteristics.11 Aircraft tend to be more predictable than patients. Though there are legal and cultural barriers to the disclosure of error, aviation's methodologies can be used to gain essential data and to develop comparable interventions. The project team has used both survey and observational methods with operating theatre staff. In observing operations, we noted instances of suboptimal teamwork and communicationsparalleling those found in the cockpit. Behaviours seen in a European hospital are shown in the box, with examples of negative impact on patients. These are behaviours addressed in crew resource management training. Further exploring the relevance of aviation experience, we have started to adapt the threat and error model to the medical environment. 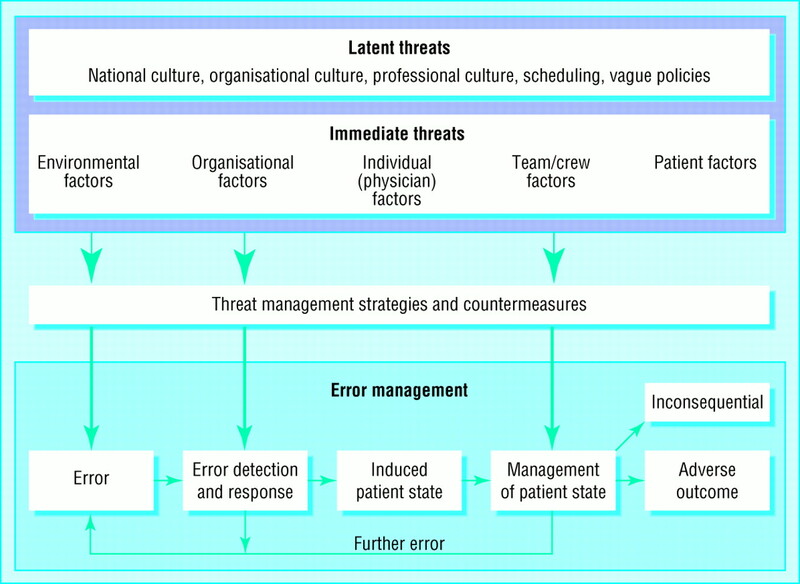 A model of threat and error management fits within a general “input-process-outcomes” concept of team performance, in which input factors include individual, team, organisational, environmental, and patient characteristics. Professional and organisational cultures are critical components of such a model. Threats are defined as factors that increase the likelihood of errors and include environmental conditions such as lighting; staff related conditions such as fatigue and norms of communication and authority; and patient related issues such as difficult airways or undiagnosed conditions. Latent threats are aspects of the system predisposing threat or error, such as staff scheduling policies. The model is shown in fig 2 and is explained more fully, together with a case study (see box for summary), on the BMJ's website. An 8 year old boy was admitted for elective surgery on the eardrum. He was anaesthetised and an endotracheal tube inserted, along with internal stethoscope and temperature probe. The anaesthetist did not listen to the chest after inserting the tube. The temperature probe connector was not compatible with the monitor (the hospital had changed brands the previous day). The anaesthetist asked for another but did not connect it; he also did not connect the stethoscope. At 10 15 the surgeon heard a gurgling sound and realised that the airway tube was disconnected. The problem was called out to the anaesthetist, who reconnected the tube. The anaesthetist did not check breathing sounds with the stethoscope. At 10 30 the patient was breathing so rapidly the surgeon could not operate; he notified the anaesthetist that the rate was 60/min. The anaesthetist did nothing after being alerted. At 10 45 the monitor showed irregular heartbeats. Just before 11 00 the anaesthetist noted extreme heartbeat irregularity and asked the surgeon to stop operating. The patient was given a dose of lignocaine, but his condition worsened. At 11 02 the patient's heart stopped beating. The anaesthetist called for code, summoning the emergency team. The endotracheal tube was removed and found to be 50% obstructed by a mucous plug. A new tube was inserted and the patient was ventilated. The emergency team anaesthetist noticed that the airway heater had caused the breathing circuit's plastic tubing to melt and turned the heater off. The patient's temperature was 108°F. The patient died despite the efforts of the code team. At first glance, the case seems to be a simple instance of gross negligence during surgery by an anaesthetist who contributed to the death of a healthy 8 year old boy by failing to connect sensors and monitor his condition. When the model was applied, however, nine sequential errors were identified, including those of nurses who failed to speak up when they observed the anaesthetist nodding in a chair and the surgeon who continued operating even after the anaesthetist failed to respond to the boy's deteriorating condition. More importantly, latent organisational and professional threats were revealed, including failure to act on reports about the anaesthetist's previous behaviour, lack of policy for monitoring patients, pressure to perform when fatigued, and professional tolerance of peer misbehaviour. Available data, including analyses of adverse events, suggest that aviation's strategies for enhancing teamwork and safety can be applied to medicine. I am not suggesting the mindless import of existing programmes; rather, aviation experience should be used as a template for developing data driven actions reflecting the unique situation of each organisation. The history must include detailed knowledge of the organisation, its norms, and its staff. Diagnosis should include data from confidential incident reporting systems and surveys, systematic observations of team performance, and details of adverse events and near misses. 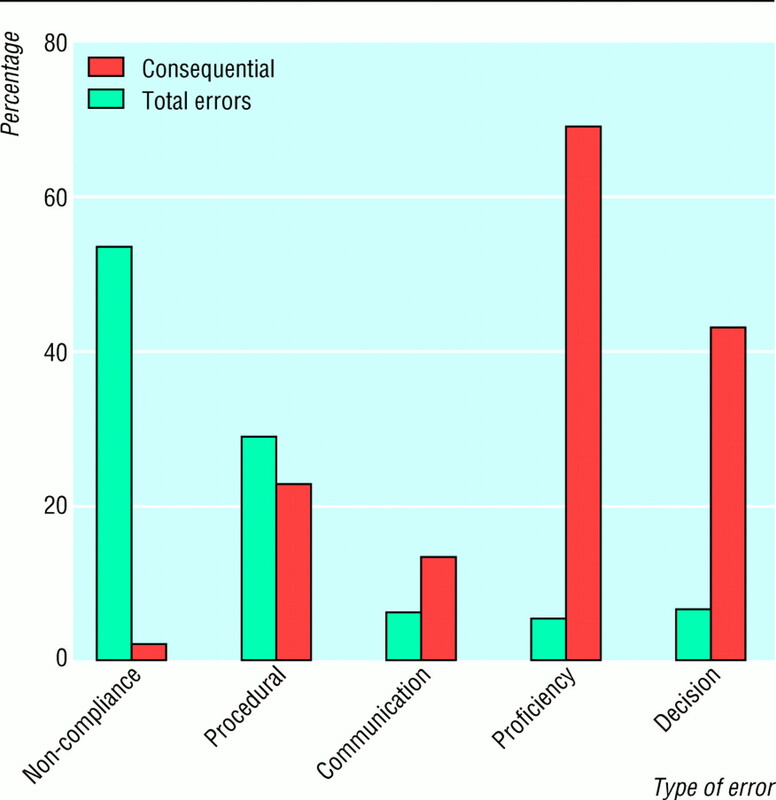 Making error management an ongoing organisational commitment through recurrent training and data collection. Some might conclude that such programmes may add bureaucratic layers and burden to an already overtaxed system. But in aviation, one of the strongest proponents and practitioners of these measures is an airline that eschews anything bureaucratic, learns from everyday mistakes, and enjoys an enviable safety record. Funding for research into medical error, latent factors in the system, incident reporting systems, and development of training is essential for implementation of such programmes. Research in medicine is historically specific to diseases, but error cuts across all illnesses and medical specialties. I believe that if organisational and professional cultures accept the inevitability of error and the importance of reliable data on error and its management, systematic efforts to improve safety will reduce the frequency and severity of adverse events. Thanks to David Musson, Bryan Sexton, William Taggart, and John Wilhelm for their counsel. Funding Partial support was provided by the Gottlieb Daimler und Carl Benz Stiftung.
. Why crew resource management? Empirical and theoretical bases of human factors training in aviation. In: Wiener E, Kanki B, Helmreich R, eds. Cockpit resource management. San Diego: Academic Press, 1993: 3–45.
. La conduite de systèmes à risques. Paris: Presses Universitaires de France, 1996.
. Culture at work: national, organisational and professional influences. Aldershot: Ashgate, 1998.
. The evolution of crew resource management in commercial aviation. Int J Aviation Psychol 1999; 9: 19–32.
. Models of threat, error, and CRM in flight operations. In: Proceedings of the tenth international symposium on aviation psychology. Columbus: Ohio State University, 1999: 677–682.
. Threat and error management: data from line operations safety audits. In: Proceedings of the tenth international symposium on aviation psychology. Columbus: Ohio State University, 1999: 683–688.
. Culture and error. In: Safety in aviation: the management commitment: proceedings of a conference. London: Royal Aeronautical Society (in press).
. Outcomes of crew resource management training. Int J Aviation Psychol 1991; 1: 287–300.
. Managing the risks of organisational accidents. Aldershot: Ashgate, 1997.
. Team performance in the operating room. In: Bogner MS, ed. Human error in medicine. Hillside, NJ: Erlbaum, 1994: 225–253.
. Human factors in the operating room: Interpersonal determinants of safety, efficiency and morale. In: Aitkenhead AA, ed. Baillière's clinical anaesthesiology: safety and risk management in anaesthesia. London: Ballière Tindall, 1996: 277–296.
. Error, stress, and teamwork in medicine and aviation: cross sectional surveys. BMJ 2000; 320: 745–749.